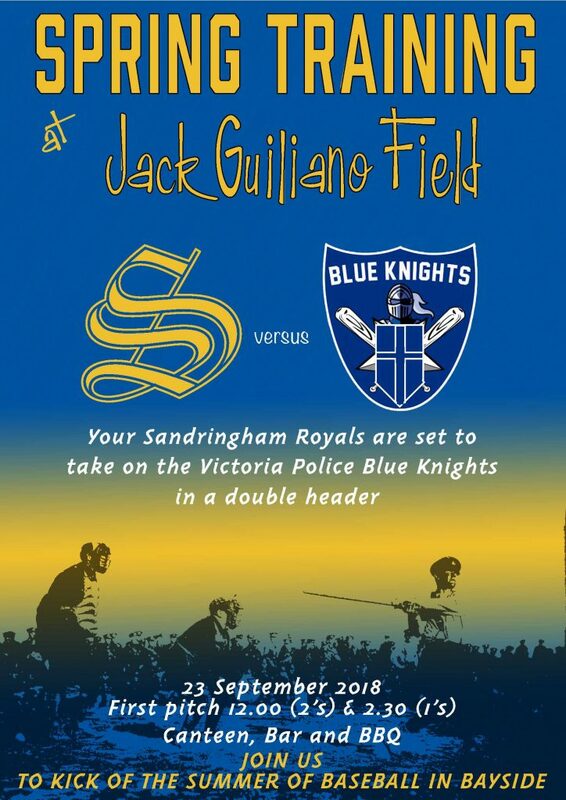 As part of the Royal’s preparations for the summer season, our 1s and 2s will be taking on the Victoria Police Baseball Club, known as the Blue Knights. The Blue Knights are a team of currently serving Police, Protective Service Officers and Police Custody Officers who are all passionate about the sport of baseball. They are made up of players incorporating all ranges of abilities, including current day Division 1 players as well as members who have played professionally in the United States and other parts of the world. Our 2s and 1s will take on the Blue Knights on Sunday 23rd September, with the 2s on at 12 noon, and the 1s on at 2:30pm. For the Royals, this will be a full dress rehearsal for the season, and we will have Fuzzy’s BBQ pumping out the burgers and snags, as well as a full canteen and bar open. Also, we have organized for the Ausport van to be down at Tulip St on the day between 11:30 and 2:30pm. Ausport are one of the largest baseball equipment retailers in Melbourne, and this will give all a chance to purchase gear for the coming season. Junior parents, this is a great opportunity to get your pants and other gear for the coming season. With spots up for grabs in our senior teams, the games will be contested hard, and we expect a big crowd to head down to Tulip St for the afternoon. We look forward to seeing as many members, supporters, and parents as possible down at the club for this preview of the coming season.